Rhino Shelters – Round Top, Barnyard or Greenhouse? Rhino shelters specialize in manufacturing instant garages constructed of a strong, galvanized steel frame stretched with highly durable, weather resistant, ripstop fabric. 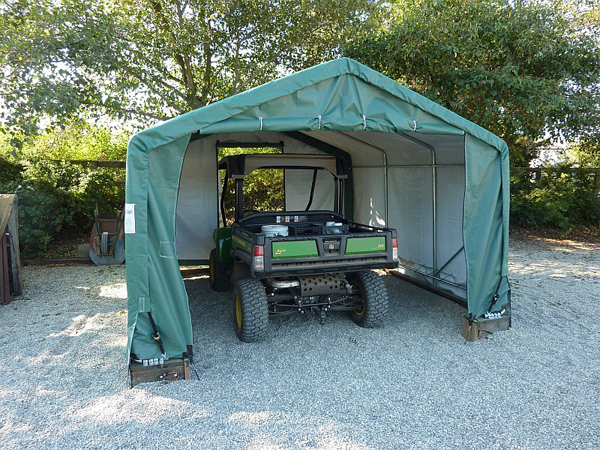 These portable garages are perfect for protecting vehicles and equipment and livestock. The lightweight and portable nature of an instant garage means they can also provide a suitable temporary work (or play) space at commercial job sites or for events, functions and parties. These portable garages come in a wide variety of different styles, sizes and colors. If the benefits of a portable garage appeal to you, read on as we take a look at some of the different, best selling models on the market. Rhino-12x12x8-instant-shed ships FREE at Storage Sheds Direct. At 14 feet high, the Rhino 14x30x12 Round Top Garage provides superior height clearance and is the tallest in this range of Round Top Garages. Its perfect for utility trucks, boats and small RVs. The full height and width front and back double zippered doors make it easy for vehicles to enter and exit the shelter. The size of the structure means it doubles well as an outdoor workshop as it is bright and well ventilated. One of the benefits of this type of instant garage is the sloping Round Top roof which means water deposits and snow loads are minimized. This Barnyard style instant garage is a 12 foot high unit and another great solution to store anything that has a lot of height. Even some of the biggest RVs and caravans can be accommodated inside. This model also comes with full height and full width zippered doors and makes a great space for an outdoor work shop. One of the benefits of a Barn style unit is that it comes with adjustable legs that means it can be assembled on uneven surfaces and still remain stable and also with additional arches that can be used to reinforce the structure to protect against heavy snow loads. This greenhouse is perfect to house anything that you are growing that requires protection and cultivation. 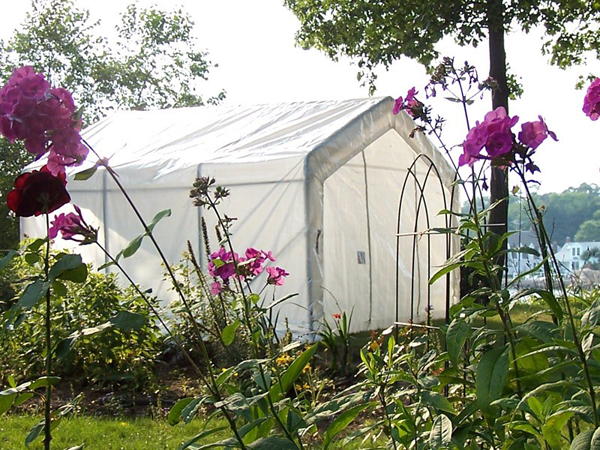 The peak-style shelter is constructed out of a semi transparent fabric that allows for light diffusion and can assist in extending the growing season by up to three months. This model is easy to assemble and the entire cover including the doors are UV resistant and fire retardant. Think that a Rhino shelter might be the portable garage you are looking for? Its worth doing some research to make sure you invest in the best type of storage solution to protect your valuables. StorageShedsDirect.com is an authorised main dealer for all of the biggest manufacturers and is currently offering FREE ground shipping within the contiguous US. Visit storageshedsdirect.com for more details. This entry was posted in Shed Articles and tagged hobby greenhouses, instant garages, portable shelters on February 24, 2014 by gorman101. Has anyone had a cover for 7 years+ I live in Northern Ca, no snow, and mild temps. If these are lasting in tougher weather conditions then I could get a couple for a boat and rv. Just concerned the covers will need replacing t often and at to high of a cost. Any info from anyone would be appreciated. Hi Dave, these covers are the best out there with a built in uv layer makes a big differences to the life span. One customer told me he had one for 10 years and it’s still in good shape. Need to protect a car that sits in driveway in CT…help de idling best roof design for winter snow leads…rounded or peaked. Hi, For CT would definitely recommend a round top shelter as they perform much better in snow. Rhino shelters pretty good for same as have stronger fabric.